I was so happy to be able to harvest nearly 1 1/2 pounds of fresh spinach from the garden yesterday. My first attempt at trying to get spinach going for fall and winter harvests was a complete and total failure. I had set out 18 spinach starts back on October 6, already a late start, and then left for a week long vacation. When I got back I found not a trace of a single spinach plant remaining. No doubt the seemingly thousands of sowbugs that inhabit my garden found the tender young seedlings and if it wasn't them then the birds probably found a way into the not so secure mesh tunnel. Bummer. But I'm always willing to test the limits of my relatively mild climate so I decided to sow another 2 dozen paper pots, each with 2 seeds. All but one of the pots had at least 1 seed germinate and I kept both seedlings in the pots where both seeds germinated. Those got set out in the garden on November 23, a ridiculously late date. This time I was determined that the sowbugs and birds would not feast before I could enjoy a single leaf. I spaced the seedlings out so that each one could be covered with a bottomless plastic gallon water bottle cloche. I placed them cheek by jowl to provide more stability in case of wind. Each bottle is pushed about an inch into the soil. The sowbugs don't seem to be able to climb the sides of the plastic bottles so I left the tops of the bottles uncapped to allow for ventilation. Just in case I trapped some baddies in the bottles I place a bit of Sluggo Plus by each plant. Look at how tiny the seedlings were. I really didn't have a lot of hope that they would produce much of anything in what was turning out to be a cold and wet November and the same was expected for the forseeable future. The cloches provided some frost protection not long after the seedlings got set out and on a number of nights since. The plants grew surprisingly quickly considering the cold weather and short days. The cloches must provide enough warmth during the day and protection at night to help the plants grow. I grew hopeful that I might get to harvest some baby spinach by the end of the year. Less than 2 weeks later the plants had grown to a "baby" leaf size! I could have harvested then but I decided to let continue to grow. Ten days later and some of the plants were starting to fill the cloches. I wasn't ready to harvest them then since I had other veggies in mind for holiday meals. Yesterday was finally harvest day. The plants looked like they were about ready to bust out and I noticed a fungal infection on a leaf that was pressed up against the plastic. The first unveiling. Not bad. I harvested the oldest leaves and left a couple of young ones on each plant. It turned out that there were very few leaves with fungal infections, mostly on the oldest leaves that were in contact with the soil. I removed all the infected leaves and any remaining seedling leaves and then the shorn plants got covered up again. Ta Da! A couple of baskets of beautiful fresh spinach. Last night I concocted a dish of the Verdil spinach wilted in homemade broth flavored with tomato conserva and sweet pepper conserva from my stores. The spinach was piled on top of garlic toasts in big wide bowls and garnished with seared red onion (from the garden), pine nuts, and crumbled feta cheese. A nice warm dish for a cold winter night. It's going to be interesting to see how soon I'll be able to harvest again. It's hard to believe that the year is swiftly coming to a close and that this is the last Harvest Monday post for 2015. Looking back at the December harvests for 2014 reveals some failure on my part to get a proper fall/winter garden going. I would typically be harvesting broccoli, celery, cabbage, kale, lettuce, perhaps some chard and spinach. This December the harvests have been dominated by broccoli, with parsnips playing a supporting role, and snow peas making cameo appearances. Although, I am expecting to show off my first winter spinach harvest next week! At least the broccoli has not been disappointing. Batavia is a new variety in my garden this year. The basket above has three large side shoots, actually secondary heads, and a few side shoots that sized up after I cut a previous secondary head. Those secondary heads came in at 9.9, 9.6, and 6.3 ounces. I used one of the larger heads to make a version of Grilled Broccoli and Bread Salad, but since it was too cold and wet to fire up the grill outside I roasted the broccoli and bread in a 400ºF oven instead and it came out great. The Apollo brokali shoots shown below were simply steamed and served with a topping of a pork sausage and chanterelle ragu that included canned tomato, tomato paste, and sweet pepper conserva from my preserved harvests - no recipe, it was something I put together with ingredients on hand. The Di Ciccio broccoli is destined for a fritatta. Di Ciccio broccoli has been a regular in my garden for years. It has been a reliable producer of leafy shoots over a long harvest period. Apollo brokali is a relative new comer, I tried it a couple of years ago and it's back again for the fall. It produces nice shoots but over a shorter period of time. Golden Sweet has become my favorite variety of snow pea. The tall vines produce pods over a longer harvest period than any green variety that I've tried. I like being able to harvest a handful at a time instead of being inundated with peas for a couple of weeks. And they're good tasting and beautiful too! Apollo brokali - 10.3 oz. Batavia broccoli - 1 lb., 13 oz. Di Ciccio broccoli - 3.4 oz. Golden Sweet snow peas - 1.3 oz. Total harvests for the week - 2 lb., 12 oz. 2015 YTD - 1228 lb., 12.7 oz. Harvest Monday is hosted by Dave on his blog Our Happy Acres, head on over there to be inspired by what other garden blogger have been harvesting lately. Happy Winter Solstice to all of you in the Northern Hemisphere, the days will start to get longer tomorrow! Sunrise today at my latitude was 7:15 and sunset will be 16:55. The funny thing is that even though the days will be getting ever so slightly longer, the sun will continue to rise a bit later every day until January 13 when it rises at 7:19, then on the 14th it rises at 7:18. We will have gone from 9:40 of daylight today to 9:54 on the 13th. You can find tables for sunrise/sunset and daylength for over 22,000 US locations here, courtesy of the US Naval Observatory. On to the harvests for last week. They weren't a lot but they were good. The short cold days keep things growing slowly so I don't have to rush to harvest the broccoli before it bursts into bloom. The main head of the third and largest Di Ciccio broccoli plant could have been harvested earlier but it was still excellent. I used this head to make another big fritatta for Dave which also included dried Tromba D'Albenga squash and dried cherry tomatoes, among other ingredients. Dave likes his fritattas to be packed with veggies. The 3 Batavia broccoli plants have been producing big beautiful side shoots, small heads really, and they have been holding well on the plants so I harvest them pretty much as I want them. The parsnips hold well in the garden also. I tried to pull just a couple but they were growing so tightly together that I had to pull the clump. A couple were entwined and the other two were getting flattened from growing so close together, but other than that they were great. I used the 3 smallest to make a modified version of the Mushroom and Parsnip Flan from Georgeanne Brennan's book The Vegetarian Table: France, I rarely follow a recipe to the letter and I made so many changes to that one that I think I can call my version my own. I've posted my recipe on my recipe blog here. We have escaped a good hard freeze so far and I've been covering the pea vines with frost cloth whenever frost threatens so I was able to harvest another handful of Golden Sweet snow peas. I've been enjoying these in salads which unfortunately have featured greens from the farmer's market and grocery store. I'll mention another delicious dish I made last week that featured a number of ingredients from my stores. The Autumn Lamb Stew with Squash, Lemon, and Mint from Paula Wolfert's book The Cooking of the Eastern Mediterranean was incredibly flavorful. It featured a number of things from the garden including Honey Nut butternut squash, onions, garlic, canned tomatoes (instead of fresh), tomato paste, pepper paste, pepper flakes, lemons, and mint. There were items not from the garden also - the lamb came from a local sheep milk cheese producer and the chickpeas were Italian (I haven't used the homegrown ones yet). I was surprised by how much flavor the dish had and I think a lot of it came from the concentrated tomato and pepper pastes, the tang of the lemon juice balanced the richness of the lamb and the sweetness of the squash. I'll be making this dish again. Batavia broccoli - 1 lb., 1.4 oz. Di Ciccio broccoli - 9.7 oz. Gladiator parsnips - 12 oz. Golden Sweet snow peas - 2.8 oz. Harvest Monday is hosted by Dave on his blog Our Happy Acres, head on over there to be inspired by what other garden bloggers have been harvesting and cooking up lately. Perhaps I should have titled this post Harvestless Monday. This is the first week in a LONG time that I've not harvested anything without the excuse of being out of town. There's actually a few things in the garden that I could have harvested - broccoli, a handful of snow peas, and a bunch of parsnips, but I didn't get around to it. I hate to miss a Harvest Monday post though so I'll post about a dish I made with some of the bounty of peppers that the garden produced this year. I had my best year ever for peppers so there's dried peppers, preserved peppers, and frozen peppers that are waiting to be consumed. Last week I wanted to use up a pound of frozen green Anaheim chile peppers that were sitting in the freezer, they had been roasted and peeled but I didn't have time to remove the cores and seeds before tossing them in the freezer. They had priority on the "use it up" list since they were frozen in a tub instead of preserved in vacuum sealed bags. I wanted to try something with the peppers that I hadn't done before and had in mind a souffle or souffled omelet. A search of my Eat Your Books list of indexed recipes came up blank but I did come across a number of recipes for sweet corn pudding souffles and it seemed like it would be easy to adapt one of the recipes to use peppers instead of corn. And it worked out brilliantly! I've posted the recipe on my recipe blog here so I'm not going to duplicate it, but I'll describe it briefly. It's much like a traditional souffle but not as light, the souffle base is more substantial. It's also prepared in 2 steps, first you bake the souffles and then let them cool and fall. Then the souffles are unmolded and baked again just before serving. They puff up a bit, not as tall as during the initial baking, but they are lighter than you would expect a pudding to be. The versatility of the recipe has got me inspired now. I think it's almost infinitely adaptable to a number of vegetables. I'm thinking that broccoli (which I still have in abundance) would be a good base. And I don't see why it couldn't be flavored with 2 or more vegetables. The souffle base has half of the veggies pureed into it and the rest of the veggies are chopped and folded into the mix. I'm thinking that a puree of eggplant and chopped roasted sweet red peppers would be a nice combo and I've got both of those in the freezer. The souffles are finished by baking them with some cream but I think they would also be good finished with a tomato sauce. So I've been dreaming of the various pudding souffles I would like to try - zucchini, asparagus, artichokes, grilled onions, and of course sweet corn when it comes back in season. 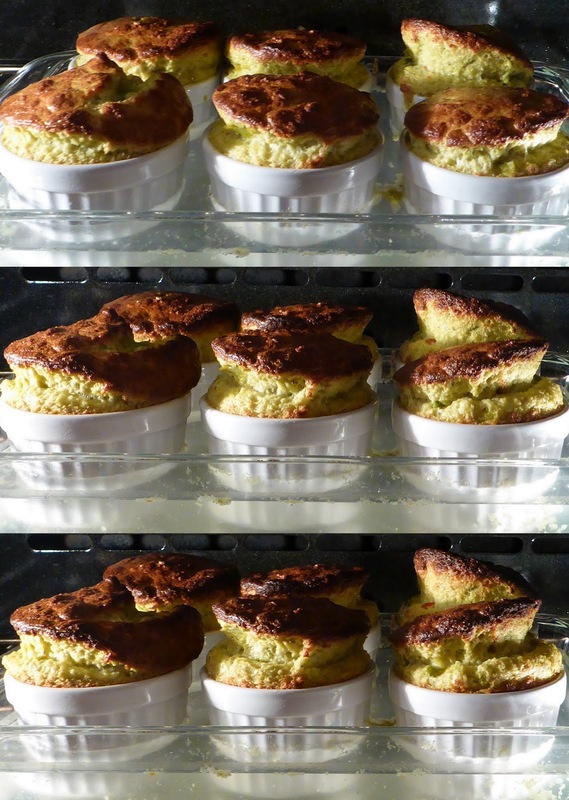 Pudding souffles at 20, 25, and 30 minutes. So that's my contribution to Harvest Monday this week. I hope I've been able to inspire some of you with a way to use up some of your harvests. Harvest Monday is hosted by Dave on his blog Our Happy Acres, head on over there to be inspired by what other garden bloggers have been harvesting or cooking up. The pepper harvests have come to an end and I've starting clearing out the plants so it's time to do an end of season review. It turned out to be an excellent year for pepper harvests overall. The total harvests for the season were up 63 pounds over last year and 45 pounds over 2013 which was my best year since I started keep track of my harvests in 2010. FYI, my worst year was a harvest of 15.5 pounds in 2011. That year there was a population explosion of hungry rats that feasted on the garden and in addition the bed that I had the peppers in was severely invaded by oak tree roots which competed with the peppers for water and nutrients and the oaks won. That was also the year before I had the big boxes installed and the beds at that time were much more shallow. This year I crammed 21 varieties of peppers into the garden, 19 in the raised bed for a total of 54 plants and a couple varieties into some 10 gallon pots and a few duplicates elsewhere in terracotta pots - 62 plants in all. That sounds crazy, 21 varieties and 62 plants, but I've grown as many as 31 varieties at one time (more than once) so I actually practiced a little restraint this year. Part of my problem is that I can't resist trying new varieties and this year 12 of the 21 were new. I set out the plants on May 25, ahead of my usual target date of June 1. A while back Margaret asked me what my spacing was for the pepper plants and I couldn't remember and hadn't recorded it and when she asked the patch was such a jungle that I couldn't figure it out. So now that I've cut down 2/3rds of the plants I can see how far apart they were - 15 inches apart in three rows that are 9 inches apart with the middle row staggered. You can see the arrangement in the photo below. I experimented with snipping out the central leader on all the plants growing in the outside row. My intention was to try to slow down production to stagger the harvest by removing the first flower buds and forcing the plants to put their energy into new growth and delay the first flowering. It didn't quite work out that way, they produced ripe peppers at pretty much the same time as the untrimmed plants and it even seemed like they produced just about as much. One benefit of trimming the plants was that it made them shorter which allowed the plants in the center to get a bit more light early on while they were producing their first blossoms and fruits. Some of the smaller plants in the center which were eventually overshadowed by larger neighbors quit producing after the initial flush of fruits. I can usually get a second flush of peppers that set after I start harvesting the first ripe peppers, but the overshadowed ones didn't do that this year. My biggest concern early in the season was that I thought the plants had been infected with Broad Mites. It seems like every year the plants start off looking really crappy, with stunted and wrinkled leaves. Every year they seem to pull through and end up looking ok and generally produce a good crop. In previous years I thought it might be an aphid vectored virus. This year I settled on the Broad Mites. Actually, I'm still not sure what the problem is. But once again the plants pulled through and produced a good crop. The last couple of years I've been inoculating the plants with beneficial mycorrhizae and bacteria. The plants seem to produce more foliage and grow more vigorously with the inoculants which helps with another problem I've had in the past - a lot of the large fruited peppers used to get sunburned because there wasn't enough foliage to protect them. There were only a few peppers that got damaged this year. Pepper plant with stunted and wrinkled leaves. I'm going to review each pepper by alphabetical order. Aji Amarillo. This was a new variety for me this year. My seeds came from Artisan Seeds which is run by Baia Nicchia Farm. The seeds were actually a freebie, I was tempted but resisted purchasing them when I placed an order for other seeds. I'm a big fan of baccatum peppers, they can be incredibly productive in my climate so long as they aren't a late producer and they are almost always very flavorful - very fruity and aromatic. So when the seeds showed up I simply had to grow them and I'm really happy I did. Aji Amarillo is described as a large plant with small fruits and very prolific. My plants weren't prolific but that's likely because I grew them in containers. The plants got to be large considering they were grown in containers, over 2 feet tall, so I imagine that they could be quite large when grown in the ground. They do have the characteristic fruity and sweetly aromatic flavor of my favorite baccatum peppers. Artisan's description made no mention of heat level so I had no idea what to expect since baccatums can range from entirely sweet to blazing hot. These turned out to be almost completely sweet, at least in my garden. Dave at Our Happy Acres grows some of the same peppers that I do but his growing conditions produce hot specimens of peppers that turn out sweet in my garden. So I suspect that these peppers have the potential to pack a bit more heat but I doubt that they would be blazing hot. One of my favorite uses for mild or moderately hot baccatum peppers is to turn them into pepper jam and that's what I did with these. The jam turned out fabulously good so I know that I'll have to grow more of these peppers next year. Maybe I'll grow them in the ground next year and see what they can really do! Craig's Grande Jalapeño. New this year. I was searching for a medium hot jalapeño to make chipotle type peppers. Craig's is supposed to be hot, but in my garden it's not. That's not all bad, they still made some great chipotle peppers that are wonderfully sweet and smoky and I can use them with abandon since they aren't at all hot. They also made a really tasty pepper jam when combined with some Mareko Fanas to spice it up. The plants were somewhat shy producers for me, probably because they got overshadowed by much more vigorous and taller neighbors. I'll grow them again next year and give them a spot where they can get more light and not be bullied out of production. My seeds came from Baker Creek and they are also available at Redwood City Seed Co.
Criolla de Cocina. Another new pepper for me. My seeds came from Baker Creek but I had read about these peppers in William Woys Weaver's book 100 Vegetables and Where They Came From. They are a Nicarguan chiltoma type pepper which means they are a sweet pepper. It is indeed nice and sweet with a thin skin and fairly thin flesh. My favorite uses for it have been either fresh in salads or sauteed in various preparations. I sliced and dehydrated some of the extras so I'll see later on how tasty they are used that way. The plants are rangy and fairly tall, about 40 to 44 inches tall when I removed them from the garden. My 2 plants produced 6.5 pounds of peppers - pretty impressive! De La Vera. This pepper comes from the region of Spain where they produce Pimentón de la Vera, the smoky paprika that comes in sweet, hot, or bittersweet (semi-hot) varieties. I've learned that there are a few varieties of peppers that are grown there for pimentón, either sweet or hot, and that the bittersweet paprika is a blend of sweet and hot paprikas. The variety that I'm growing looks like a hot cayenne type but it is entirely sweet. I grew these peppers a few years ago in containers and simply dried them to use as paprika. I wasn't terribly impressed back then. But last year I figured out how to smoke peppers in my Big Green Egg and so I decided to give De La Vera another chance. This time I've become smitten - the smoked peppers make a fabulous smoky sweet paprika - Pimentón de Carmel Valley. I'll be growing them again. My seeds came from the Seed Savers Exchange Heritage Farm. You have to be a SSE member to request the seeds since these come from the annual members yearbook not the catalog. The plants turned out to be very vigorous and sturdy, they were over 4 feet tall and had thick woody stems when I took them down this week. The three plants produced nearly 7 pounds of peppers over a long period, the plants were still blooming and setting peppers even at the end of November. Florina Greek. My seeds for these sweet peppers came in an exchange with a gardener who reads my blog. He received his seeds from someone else who got their seeds from Greece. The peppers are commercially grown in northwestern Greece in the region for which they are named - Florina. The peppers are large, long and tapered, with thick sweet flesh - perfect for roasting - which I think is how they are typically prepared in Greece. I'm so happy that I've had the chance to grow these peppers. The flavor when they are roasted is outstanding, sweet with a hint of sweet spice. The plants are medium tall, a little more than 2 1/2 feet in my garden and the one plant I grew in a pot barely reached 2 feet. They were fairly productive also, the three plants produced 6.8 pounds of peppers, mostly from the plants in the raised bed. I wouldn't recommend growing them in pots since the peppers are large and don't reach their full potential when the plants are confined to a pot. I'll be growing these again next year. Giallo di Cuneo. This is the third year for this pepper in my garden. It is a sweet golden bell pepper that seems to be well suited to my cool coastal climate, although it is one of the later peppers to ripen here. The peppers are variable in size and shape, from medium-large typical blocky bells to small with a number of lobes. The flavor is sweet, the flesh moderately thick, the skin is thin. I like to eat it raw or roasted. It was a generous producer this year, 8.5 pounds of peppers from three plants. The plants are on the small side, eventually getting to a couple feet tall. I'm actually undecided about whether or not I'll grow it again next year. It is a good pepper, but I've found another sweet golden pepper that I like even better raw and in terms of a roasting pepper there are others that I think hold up to the heat better - but none of those are golden. So, do I keep it for its good looks? Or does it get elbowed out of the lineup because of space constraints. I guess I'll figure that out next year. Seeds for this variety are available at Seeds From Italy. Gogosar. (aka Gogosari) Another new pepper in the garden and a new favorite. I've grown a few pimento/cheese/sheepnose type peppers over the years, including most recently Topepo Rosso, Sunnybrook Pimento, and Liebesapfel. None of them compare to Gogosar. One of my gardening friends from my days as a volunteer Master Gardener turned me on to these peppers. He told me that it is far superior to the Topepo Rosso pepper that I grew last year and the year before and he was right on. It is a very thick fleshed pepper, even for a pimento pepper. It's very flavorful, sweet and crunchy eaten raw, but it's even better when baked. I didn't experiment with roasting and peeling them since I had so many other roasting peppers this year, but I think they would be excellent prepared that way. The pepper's squat shape and thick flesh make it perfect for stuffing and roasting which was what I did with most of my crop. They're easy to core and remove the seeds and they don't fall over or collapse while baking. The plants got to be about 2 1/2 feet tall and were moderately productive, the 3 plants produced about 7 1/2 pounds altogether, which was far better than what I got from Topepo Rosso last year. I'm sorry to say that the seeds aren't readily available. This is another variety that I got from Seed Savers Exchange Heritage Farm and my friend gets his seeds from Europe. If you are member of Seed Savers Exchange you can request the seeds through the annual yearbook. IPK CAP 268 (Chile). This is yet another new pepper that I tried this year and also from Seed Savers Exchange Heritage Farm via the yearbook. This pepper was an almost entirely unknown entity, all I knew was that it was sweet and the origin was Chile. IPK is a seedbank in Gatersleben, Germany and SSE has a number of offerings that they acquired from them. So far as I can tell this pepper was originally collected in Chile by Nikolai Vavilov on his collecting expedition through South America and seeds for it eventually ended up in the IPK seedbank and thence on to the SSE collection. I had been on a hiking trip to Chile and Argentina which prompted my interest in this pepper. I was hoping that it might be the pepper that is used to make the Chilean spice blend Merkén, a blend of smoked chiles, salt, and coriander seed, but it turned out not to be. It is an interesting pepper though - small, very sweet, thick fleshed and thick skinned. I didn't like eating it fresh because of the thick skins, they're a bit tough for my taste. They were good roasted and peeled, although their small size made them somewhat fiddly for that preparation. I found that my favorite use for them was dried and ground into a sweet paprika - it came out a brilliant red color and very sweet. They were an interesting pepper to grow but I probably won't grow them again next year since I'll be trying more experimental peppers from the SSE collection. But they could be back again another year. Lady Bell. My red bell pepper of choice because it is so well adapted to my cooler climate and is a very good tasting and productive pepper. It was the clear winner when I trialed a few red bell pepper varieties back in 2012, beating out both "King of the North" and "Wisconsin Lakes" for productivity and quality. It's a hybrid that is widely available, my first packet of seeds came from Territorial and my latest packet from Harris Seeds. It was not as productive for me this year because the plants got wedged between some taller growing varieties. It put out a good first flush of peppers but didn't go on to produce a second flush. The three plants produced a total of 7.9 pounds. The majority of the crop were roasted and preserved which is my favorite way to consume them. Mareko Fana. This is the pepper that I purchased from Artisan Seeds. There's an interesting story behind it, the peppers are originally from Ethiopia and ended up at Baia Nicchia Farm through a collaboration with Menkir Tamrat who needed space to grow the peppers and other vegetables that he had sourced from his homeland. You can read more about how that collaboration blossomed here. Mareko Fana peppers are the basis for the Ethiopian spice blend called Berbere. I've not yet found a good recipe for making a somewhat authentic version of Berbere, it contains some ingredients that aren't readily available outside of Ethiopia, but I have found that the dried peppers make superb pepper flakes. The peppers are also delicious fresh, either green or ripe, I've been using them as I would jalapeños or serranos, in salsas or sauces or sautes. And they were a great addition to a batch of pepper jam, adding spice to a batch of sweet jalapenños. The plants are very vigorous growers and got to be quite large, close to 5 feet tall in my garden. They are prolific producers, my three plants produced nearly 9 pounds of peppers. I know that next year I'll only need 1 or 2 plants, depending on how quickly I go through my ground pepper flakes, which has been pretty quickly. The ripe peppers are brown as you can see below, but the flesh has more of a red tint so the pepper flakes turn out a brick red color. NTR. As in Not Topepo Rosso, an off type that came from a packet of Topepo Rosso seeds last year and that turned out to be very tasty, especially when smoked and ground into paprika. I saved seeds last year and tried a few plants this year. Well, every plant came out different, one short, one medium length, and the other shaped like an Anaheim and all of them sweet. What I like about the pepper last year is that it had a hint of spice to it which none of the offspring this year had. The peppers were good, but this is the end of the experiment, I'm not going to fuss with trying to get a true to type NTR, especially since none of them are the same as the pepper last year. I smoked and dried or simply dried the majority of the crop - more paprika! Odessa Market. Another winner from my 2012 sweet pepper trial, I've grown them every year since then. I wrote a Spotlight post about it recently and reported then that the seeds are very difficult to find, but it's a bit easier now because Fedco has them back. You can read more about them on my spotlight post, but I'll just repeat how well they produced for me this year - 17 pounds of peppers from 4 plants. And productivity isn't their only shining attribute - they are beautiful, versatile, and delicious too. If I had room for only a few peppers in the garden they would be in the lineup. Padron. Another pepper that has earned a permanent spot in the garden. I've been growing these for at least 12 years, maybe longer. They came to my attention when I was volunteering as a Master Gardener years ago and a group of us visited the farm that introduced Padrons to California - Happy Quail Farm. We started growing them in our demonstration garden and most of us fell in love these delicious peppers. I can't believe that I haven't done a spotlight post on them yet. My plants produced a steady stream of baby peppers through the season, starting in July when they are always the first peppers to be harvested since they are picked as babies. I harvested the last handful on November 29 a few days after we had a few frosty nights. The frost wasn't that severe so the plants were barely zinged and the peppers that had escaped the harvest basket before the frost were still good. The final tally came to 10.4 pounds from 3 plants, and who knows, there might be a few ounces more... Padron seeds are pretty easy to find these days, mine came from Seeds From Italy. Piment Doux Long de Landes. A French sweet frying pepper, similar to Jimmy Nardello. I went on a French veggie kick a few years ago, actually ordering seeds from France and this was one of the bunch and the only veggie from that source that I saved seeds from and continue to grow. It is thin skinned and thin fleshed. It's tasty raw, I like to cut it crosswise into rings, pop out the seeds, and add the pretty pepper rings to salads. I'll cut them the same way and add them to sautes and stir frys. And they are very good as a dried pepper also. This year I dried a lot of them, cut lengthwise with the cores and seeds removed, and once dried I cut them crosswise into strips so they are ready to use. They dried peppers are thin enough that they generally don't need to be rehydrated before using, they'll soak up enough moisture from other ingredients to soften. I usually enjoy them ripe but they are also very good when green. If you're in the mood for a splurge you can order seeds from frenchgardening.com. Rezha Macedonian. An interesting pepper. I think that's the extent of my praise for this one. The name supposedly means "etched" which refers to the corky stripes that develop as the peppers mature. It turned out to be mildly spicy, less than a jalapeño. The flesh is very thin and somewhat sweet. I tried these smoked and ground into paprika, which is nice but I prefer the De La Vera. And I tried them dried and ground into paprika, which is also nice, but not enough to entice me to grow them again. I even tried roasting a few which didn't work out because the corkiness of the skin made them too difficult to peel. That corkiness also makes them less than great for eating fresh. I didn't try cooking with any of them, perhaps that would soften the corkiness. The plants were modest producers, I had 2 in the raised bed and 2 in pots, those 4 plants produced 4.5 pounds in all. Like I said, an interesting pepper but I don't think I'll be growing them again. Rosso Dolce da Appendere. This ended up in the garden because of a failure to resist temptation. I was ordering other veggie seeds from Seeds From Italy and of course I had to check out the pepper selection and this one called to me. It's a large sweet pepper that was compared to Corno di Toro. The flesh is medium thick and the skin is thin. It was good used as a frying pepper, which is what it is described as being, but it also took well to roasting and peeling. I accidentally harvested a couple of them green because they were growing alongside the Anaheim peppers which they resemble when they are green, so I found out that they are tasty when green. They ripened a bit later that most of the other sweet peppers but not too late and it was nice to not have ALL the peppers ripening at once. I'll probably be growing these again next year. Shepherd's Ramshorn. (aka Shephard's Ramshorn) Here's another sweet pepper that I favorited in the 2012 sweet pepper trial. It is first and foremost delicious, but it is also productive and early. My 4 plants produced 10 pounds of peppers this year and would have produced more had they not been overshadowed by larger plants. I had forgotten that it's not a very tall plant, but in spite of the competition they still produced a number of nice big peppers. It is one of my favorite peppers for roasting. The large smooth thick fleshed peppers are very well suited to that preparation. The look a lot like the Florina peppers, but there are differences - they ripen earlier, they are a bit heftier with slightly thicker flesh and broader shoulders, and they are, at least this year, more productive. Shepherd's Ramshorn doesn't have to be worried about being bumped from the lineup by a newcomer, it's still one of my favorites and I will definitely be growing it again next year. My seeds came from Adaptive Seeds where they can still be found. Sonora Anaheim. I like to have at least one mild green Southwestern type chile pepper in the garden and for the last few years it has been Sonora Anaheim. I like it because it produces large and flavorful peppers that are easy to roast. They have a very tough thick skin which makes them less suitable as a frying pepper, but that skin peels off so easily when roasted. The only thing that I could wish for is that the peppers would be large through the season since they get progressively smaller as the season goes on. The plants are large, almost 4 feet tall in my garden, and very productive, my 3 plants produced 16.6 pounds this year. Hmm, perhaps I'll cut that down to 2 plants next year. I harvest most of the peppers when they are green or just starting to develop a hint of red, then roast and peel them, and then whatever we don't eat right away gets frozen. My seeds came from Gourmet Seed, but they are out of stock at the moment. Syrian Three Sided. Bleah, it's been a long time since I've grown a pepper that I simply don't like and wish hadn't taken up valuable space in the garden. My relationship with this pepper got off to a rocky start when the seeds proved difficult to get to germinate - strike 1. I eventually got some plants to grow which were perfectly good so far as pepper plants go in my garden. But a number of the first peppers to form developed blossom end rot when no other peppers in the garden did - strike 2. They took a LONG time to ripen - strike 3. And the boot came when I discovered that they taste awful. They aren't very sweet, which isn't always a bad thing, but they finished with a horrible bitterness. I made a batch of pepper conserva that was about half STS and had to throw it away because it was so terribly bitter. I thought that perhaps it was just because the conserva is so concentrated, but a taste of more than one fresh ripe pepper that left that yucky lingering bitter flavor in my mouth prompted me to toss the entire harvest in the compost - 9.7 pounds in the tally and a bunch of big still green peppers that were remaining on the plants last week. By the way, the green peppers taste awful also. This pepper is definitely OUT of the lineup. Yummy Belles. This pepper is a real sweetheart. Sweet, petite, pretty, and crisp - it's the best snacking pepper that I've enjoyed in a long time. It's a new pepper this year also, sort of, a couple years ago I grew some Happy Yummy peppers that Dave from Our Happy Acres shared with me and I didn't realize that his Happy Yummy peppers were off type spicy Yummy Belles. It did occur to me that the Yummy Belles looked a lot like the Happy Yummies but I didn't get the connection until Dave pointed it out to me - duh. Sorry Dave, the Happy Yummies are good, but I have fallen hard for the totally sweet Belles. The plants are petite also, about 2 feet tall in my garden and fairly productive, my 3 plants produced 9.6 pounds of peppers. Renee's Garden Seeds, my source, says that they are suitable for growing in containers. These will be back again next year. Here's a summary of the pepper harvests this year. Now that the pepper season has come to an end I'm already looking forward to next year and have even purchased seeds for some new varieties, check them out on my 2016 Planned Varieties page.